transporters. By using a combination of carbohydrates that use different intestinal transporters for absorption (multiple transportable carbohydrates), carbohydrate delivery and oxidation can be increased. Exogenous carbohydrate oxidation rates reach values of 1.75 g/min with multiple transportable carbohydrates whereas previously it was thought that 1 g/min was the absolute maximum. Multiple transportable carbohydrates, ingested at high rates, can be beneficial during endurance sports where the duration of exercise is 2.5 h or more. During moderate intensity exercise carbohydrate and fat are the two important fuels and their relative contribution is dependent on a number of factors including the pre-exercise carbohydrate stores, the exercise intensity and duration and the training status of the subject (Jeukendrup, 2003). During intense exercise (and thus most competitive situations) carbohydrate is the critical fuel, and the reduction of carbohydrate stores in the muscle (muscle glycogen) has been linked to exercise performance (Bergström et al., 1967; Rodriguez et al., 2009). In the 1960s and into the ‘80s studies investigated the role of high muscle glycogen stores at the onset of exercise (carbo-loading) on exercise performance (Bergström et al., 1967). From the ‘80s until now research has focused more on the potential role of carbohydrate ingested just before and during exercise. Although the exact mechanisms are still not entirely clear, it has been known for some time that carbohydrate ingestion during exercise can increase exercise capacity (time to exhaustion) and improve exercise performance (time trials) (for reviews see, Jeukendrup, 2004, 2008, 2010, 2011; Jeukendrup & McLaughlin, 2011). Since then, studies have investigated the effects of different feeding regimens, different types of carbohydrate and different amounts of carbohydrate in order to make the recommendations more specific. This Sports Science Exchange article will focus on these recent studies and will be limited to the role of carbohydrate ingested during exercise. To study the efficacy of various carbohydrates isotopic labeling has been used. Basically the carbon in the carbohydrate is labeled with 13C and after oxidation in the body the 13C will appear in the CO that is exhaled. By knowing the 13C enrichment of the drink, the total CO produced and the 13C enrichment of the exhaled CO , it is possible to measure exogenous carbohydrate oxidation or the amount of carbohydrate that has been used from the blood. This method enabled investigators to describe the time course of oxidation of a carbohydrate and also compare the oxidation of different carbohydrates. During exercise most carbohydrate oxidation takes place in muscle, and studies have demonstrated that nearly all of the ingested carbohydrate appears in the circulation and is used by muscle (Jeukendrup et al., 1999). When carbohydrates are ingested from the onset of exercise and at regular intervals thereafter, oxidation of the ingested carbohydrate increases and typically reaches a plateau after 60-90 min. A variety of carbohydrates including glucose, fructose, galactose, sucrose, maltose and glucose polymers were studied. It was found that fructose was oxidized at lower rates than glucose (Burelle et al., 2006) and galactose oxidation rates were almost 50% lower (Burelle et al., 2006; Leijssen et al., 1995). This was explained by differences in absorption as well as the fact that fructose and galactose have to be converted to glucose in the liver before they can be oxidized in the muscle. Maltose (2 glucose molecules) and glucose polymers (multiple glucose molecules) behave identically to glucose, indicating that the hydrolysis, which takes place in the oral cavity and intestines, was not a limiting factor. Even a high molecular weight starch is oxidized at the same rate as glucose (Rowlands et al., 2005). Interestingly, sucrose (2 glucose molecules) ingestion seems to give high oxidation rates even though the breakdown of sucrose results in glucose and the fructose oxidized at lower rates. Other, less common carbohydrates, like isomaltulose and trehalose are also oxidized at lower rates. In summary, there are many different types of carbohydrates and these can be roughly divided into two categories: carbohydrates that are oxidized rapidly (up to ~60 g/h or 1 g/min) and carbohydrates oxidized relatively slowly (up to ~30 g/h or 0.5 g/min). Rapidly oxidized carbohydrates include glucose, maltose, sucrose, maltodextrin and amylopectin starch. Slower oxidized carbohydrates include fructose, galactose, isomaltulose, trehalose and amylose. Prior to 2004, it was believed that even when “fast carbohydrates” were ingested during exercise, these could not be oxidized at rates higher than 1 g/min (60 g/h). The evidence has been reviewed in detail elsewhere (Jeukendrup, 2004, 2008; Jeukendrup & Tipton, 2009). The views at that time are still reflected in the current guidelines by the American College of Sports Medicine (ACSM), which state that athletes should take between 30 and 60 grams of carbohydrate per hour (Rodriguez et al., 2009). Although the observation of a maximum exogenous carbohydrate oxidation rate of around 1 g/min was generally accepted, the reasons for this apparent ceiling were unclear. The potential limitations were thought to include gastric emptying, intestinal absorption, liver glycogen synthesis and therefore reduced systemic appearance of the carbohydrate (glucose), or muscle glucose uptake. It was demonstrated in a number of studies that gastric emptying of carbohydrate greatly exceeded 1 g/min and therefore this was excluded as the main limiting factor. At the time it seemed impossible that intestinal absorption was limiting because many textbooks quoted that the capacity to absorb carbohydrate was virtually unlimited. After absorption the carbohydrate would end up in the liver through the portal vein and it was in theory possible that carbohydrate was stored there before it could reach the muscle. However, one study in particular suggested that the liver could not be the limiting factor either. In this study subjects exercised for 5 h and ingested relatively large amounts of glucose (Jeukendrup et al., 2006). There was so much carbohydrate unaccounted for when oxidized carbohydrate was subtracted from ingested carbohydrate that it would have been impossible for this amount to be stored in the liver. It was also demonstrated that muscle glucose uptake was not limiting as glucose uptake was much higher when glucose was directly infused into the circulation (Hawley et al., 1994). Since neither gastric emptying, liver glycogen synthesis, nor muscle glucose uptake could explain the limitations to exogenous carbohydrate oxidation, attention shifted to intestinal absorption of the carbohydrate. 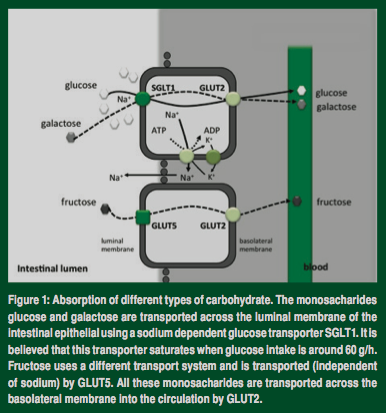 Glucose is absorbed through a sodium dependent glucose transporter protein called SGLT1 (Figure 1). This transport protein in the brush border membrane has a high affinity for glucose and galactose but not fructose (Kellett, 2001). It was hypothesized that the limitation for exogenous carbohydrate oxidation was saturation of the SGLT1 transporters in the brush border membrane of the intestine, which may occur at high rates of glucose ingestion (Jentjens et al., 2004). So essentially when a carbohydrate that uses SGLT1 is ingested at a rate of 1 g/min, this transporter may saturate and ingesting more of a specific carbohydrate may not result in an increased appearance of that carbohydrate in the circulation. ructose absorption follows a completely different path and is not affected by the saturation of SGLT1. It is absorbed independently by a sodium independent transporter called GLUT5 (Ferraris & Diamond, 1997). So the combined ingestion could result in an increased total delivery of carbohydrates into the circulation and increased oxidation by the muscle. Subsequent studies were therefore designed to deliver glucose at a rate of 1.2 g/min and fructose at a rate of 0.6 g/min with the total carbohydrate ingestion being 1.8 g/min and compare this to the ingestion of 1.8 g/min of just glucose. In this groundbreaking study by Jentjens et al. (2004a), trained cyclists exercised for 3 h at a moderate intensity and ingested equal energetic amounts of either glucose or glucose:fructose. The oxidation rates in the glucose trials peaked at ~ 0.8 g/min whereas the oxidation rates with glucose:fructose peaked at ~ 1.26 g/min (Figure 2, left three bars). This was the first study to demonstrate that, with the use of multiple transportable carbohydrates, exogenous carbohydrate oxidation rates could be increased to well over 1 g/ min. It also demonstrated that fructose, when used in combination with glucose, can be oxidized at relatively high rates. he studies that followed investigated various combinations of different carbohydrates such as glucose:sucrose:fructose, glucose:sucrose, and maltodextrin:fructose, and these blends of carbohydrate were ingested at different ingestion rates (Figure 2). The ingestion of a glucose:maltose mixture was oxidized at the same rate as glucose only, because maltose is hydrolysed to glucose and thus uses the same intestinal carbohydrate transporter SGLT1 (Jentjens et al., 2004b). A mixture of glucose:sucrose however, ingested at a rate of 1.8 g/min resulted in 18% higher peak exogenous carbohydrate oxidation rates (Jentjens et al., 2004ab). When glucose:sucrose was ingested at very high rates (2.4 g/min) oxidation rates peaked at 1.2 g/min, lower than anticipated. Although direct comparisons between studies are somewhat problematic, it appeared that in this study a very high ingestion rate did not result in higher oxidation rates compared with glucose:fructose at more practical intakes (Jentjens et al., 2004a). When a mixture of glucose:sucrose:fructose was ingested at these high rates, however, peak oxidation rates as high as 1.7 g/min were observed (Jentjens et al. 2004c). Finally, the ingestion of glucose:fructose at an average rate of 2.4 g/min resulted in 65% greater oxidation than glucose only and very high peak oxidation rates of 1.75 g/min were reached (Jentjens & Jeukendrup, 2005). This is the highest exogenous carbohydrate oxidation rate reported in the literature to date. However, from a practical point of view the most exciting finding was perhaps that of the maltodextrin:fructose mix (Wallis et al. 2005). This combination of carbohydrates is not as sweet as the other mixtures discussed above and is therefore more palatable. In this study oxidation rates reached 1.5 g/min at an ingestion rate of 1.8 g/min. In subsequent studies, more practical but still quite large amounts of carbohydrate were ingested by the subjects (1.5 g/min) and it was observed that the subjects’ ratings of perceived exertion (RPE) tended to be lower with the mixture of glucose and fructose compared with glucose alone and that cyclists were able to maintain their cadence better toward the end of 5 h cycling (Jeukendrup et al., 2006). Rowlands et al. (2008) also reported reduced fatigue when ingesting a maltodextrin:fructose mix vs. maltodextrin alone. It was also demonstrated that a glucose:fructose drink could improve exercise performance (Currell & Jeukendrup, 2008) compared with a glucose drink. Cyclists exercised for 2 h on a cycle ergometer at 54%VO2max during which they ingested either a carbohydrate drink or placebo and were then asked to perform a time trial that lasted another ~ 60 min. The results were astounding. When the subjects ingested a glucose drink (at 1.8 g/min), they improved their average power output by 9% as compared with placebo (254 vs. 231 W). However, when they ingested glucose:fructose, there was another 8% improvement of the power output over and above the improvement by glucose ingestion. This was the first study to demonstrate a clear performance benefit with glucose:fructose compared with glucose (Currell & Jeukendrup, 2008). These results were confirmed by further studies which showed improved 100k time trial performance (Triplett et al., 2010), improved mountain bike race performance (Rowlands et al., 2012), as well as improved high intensity laboratory cycling performance (Rowlands et al., 2012). It is important to note that in order to benefit from a glucose:fructose mixture it may be necessary to saturate glucose transporters in the intestine by ingesting sufficient quantities of glucose. When carbohydrate is ingested at rates of 0.8 g/min and saturation may not occur, ingesting part of this carbohydrate as fructose may not result in higher exogenous carbohydrate oxidation rates (Hulston et al., 2009). It is also likely that the exercise duration needs to be relatively long for these ergogenic effects to become obvious. Studies so far have demonstrated these effects when exercise was 2.5 h or longer. It is also important to note that these studies were all performed in relatively well-trained cyclists who exercised at high power outputs and had high carbohydrate oxidation rates and energy expenditures. hese results are unlikely to be applicable to the 5 h marathon runner who completes a marathon at a much lower absolute intensity with much lower total carbohydrate oxidation rates. More recent work focused on the effects of high rates of mixed carbohydrate ingestion on gastric emptying and fluid delivery. Again the results were remarkable. Gastric emptying measured by either a gastric tube or by using a 13C-acetate tracer was found to be improved with a glucose:fructose mixture compared with glucose (Jeukendrup & Moseley, 2010). Fluid delivery has also been shown to be improved with glucose:fructose compared with glucose in a number of studies (Currell et al., 2008; Jentjens et al., 2006; Jeukendrup & Moseley, 2010). In addition, studies have demonstrated greater oxidation efficiency with multiple transportable carbohydrates compared with a single carbohydrate. This indicates that more of the ingested carbohydrate is oxidized and less is residual in the intestine. As a result of faster gastric emptying and increased absorption, most studies have also reported less gastrointestinal distress with multiple transportable carbohydrates compared to an isoenergetic amount of a single carbohydrate source (Rowlands et al., 2012). 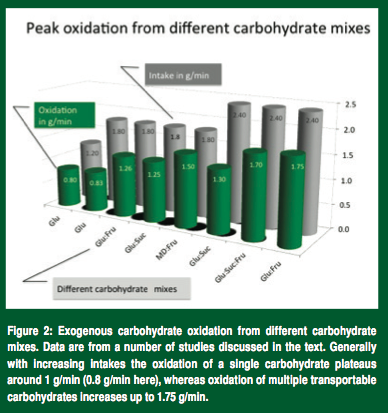 Individual differences in exogenous carbohydrate oxidation are relatively small. There appears to be no correlation between body mass and exogenous carbohydrate oxidation. The reason for this is probably because the limiting factor is carbohydrate absorption and absorption is largely independent of body mass. It is likely that the small variation in carbohydrate oxidation is a result of the absorptive capacity of the intestine which in turn may be related to the carbohydrate content of the diet. It has been shown in animal studies that intestinal transporters were upregulated with increased carbohydrate intake and one human study so far has demonstrated a similar effect (Cox et al., 2010). Early studies showed no difference in exogenous carbohydrate oxidation between well trained and untrained individuals (Jeukendrup et al., 1997; van Loon et al., 1999). Perhaps when the absolute exercise intensity and therefore total carbohydrate oxidation drops below a certain level, exogenous carbohydrate oxidation may also be reduced (Pirnay et al., 1982). Therefore, recommendations based on these studies may have to be adjusted downwards slightly for those exercising at lower absolute exercise intensities. Since exogenous carbohydrate is independent of body mass or muscle mass, but dependent on absorption and to some degree power output, the advice given to athletes should be in absolute amounts (Jeukendrup, 2010). These results clearly show that there is no rationale for expressing carbohydrate recommendations for athletes per kg body mass. • Based on the evidence here, guidelines may have to be adjusted for prolonged events (>2.5 h). During these events, competitive and well-trained athletes should consider increasing their carbohydrate intake to 90 g/h. • The carbohydrate source should be a mix of glucose and fructose, or maltodextrin and fructose in a ratio of roughly 2:1, so there is 60 g/h of glucose or maltodextrin (to saturate the SGLT1 transporters) and 30 g/h of additional fructose for oxidation. • Higher rates of intake may be considered and tolerated, but are not always possible from a practical standpoint. • The practical implications and the recommendations for athletes are discussed in more detail in another SSE article (JEUKENDRUP SSE 2012) and in a recent publication (Jeukendrup, 2011). The ingestion of a combination of carbohydrates that use different intestinal transporters for absorption, carbohydrate delivery and oxidation can be increased. These increases are seen when a carbohydrate is ingested that uses SGLT1 for absorption and a secondary carbohydrate that uses a different transport system are ingested simultaneously. Increased oxidation is only seen when the SGLT1 dependent carbohydrate is ingested at high rates (1 g/min). Whereas previously it was believed that the maximum absolute oxidation rate of ingested carbohydrate oxidation was 1 g/min, recent studies with multiple transportable carbohydrates have reported values up to 1.75 g/min. The increased carbohydrate oxidation with multiple transportable carbohydrates was accompanied by increased fluid delivery and improved oxidation efficiency and thus the likelihood of gastrointestinal distress may be diminished. Studies have also demonstrated reduced fatigue and improved exercise performance with multiple transportable carbohydrates compared with a single carbohydrate. Therefore multiple transportable carbohydrates, ingested at high rates, can be beneficial during endurance sports where the duration of exercise is 2.5 h or more. Guidelines will have to be adjusted to take these findings into account. Bergström, J., L. Hermansen, E. Hultman, and B. Saltin (1967). Diet, muscle glycogen and physical performance. Acta Physiol. Scand. 71: 140-150. Burelle, Y., M.C. Lamoureux, F. Peronnet, D. Massicotte, and C. Lavoie (2006). Comparison of exogenous glucose, fructose and galactose oxidation during exercise using 13C-labelling. Br. J. Nutr. 96: 56-61. Cox, G.R., S.A. Clark, A.J. Cox, S.L. Halson, M. Hargreaves, J.A. Hawley, and L.M. Burke (2010). Daily training with high carbohydrate availability increases exogenous carbohydrate oxidation during endurance cycling. J. Appl. Physiol. 109: 126-134. Currell, K., and A.E. Jeukendrup (2008). Superior endurance performance with ingestion of multiple transportable carbohydrates. Med. Sci .Sports Exerc. 40: 275-281. Currell, K., J. Urch, E. Cerri, R.L. Jentjens, A.K. Blannin, and A.E. Jeukendrup (2008). Plasma deuterium oxide accumulation following ingestion of different carbohydrate beverages. Appl. Physiol. Nutr. Metab. 33:1067-1072. Ferraris, R.P., and J. Diamond (1997). Regulation of intestinal sugar transport. Physiol. Rev. 77: 257-302. Hawley, J.A., A.N. Bosch, S.M. Weltan, S.D. Dennis, and T.D. Noakes (1994). Effects of glucose ingestion or glucose infusion on fuel substrate kinetics during prolonged exercise. Eur. J. Appl. Physiol. 68:381-389. Hulston, C.J., G.A. Wallis, and A.E. Jeukendrup (2009). Exogenous CHO oxidation with glucose plus fructose intake during exercise. Med. Sci. Sports Exerc. 41: 357-363. Jentjens, R.L., and A.E. Jeukendrup (2005). High rates of exogenous carbohydrate oxidation from a mixture of glucose and fructose ingested during prolonged cycling exercise. Br. J. Nutr., 93: 485-492. Jentjens, R.L., L. Moseley, R.H. Waring, L.K. Harding, and A.E. Jeukendrup (2004a). Oxidation of combined ingestion of glucose and fructose during exercise. J. Appl. Physiol. 96: 1277-1284. Jentjens, R L., M.C. Venables,and A.E. Jeukendrup (2004b). Oxidation of exogenous glucose, sucrose, and maltose during prolonged cycling exercise. J. Appl. Physiol. 96:1285-1291. Jentjens, R.L., J. Achten, and A.E. Jeukendrup (2004c). High oxidation rates from combined carbohydrates ingested during exercise. Med. Sci. Sports. Exerc. 36:1551-1558. Jentjens, R.L., K. Underwood, J. Achten, K. Currell, C.H. Mann and A.E. Jeukendrup (2006). Exogenous carbohydrate oxidation rates are elevated after combined ingestion of glucose and fructose during exercise in the heat. J. Appl. Physiol. 100: 807-816. Jeukendrup, A.E. (2003). Modulation of carbohydrate and fat utilization by diet, exercise and environment. Biochem. Soc. Trans. 31:1270-1273. Jeukendrup, A.E. (2004). Carbohydrate intake during exercise and performance. Nutrition 20: 669-677. Jeukendrup, A.E. (2008). Carbohydrate feeding during exercise. Eur. J. Sport Sci. 8: 77-86. Jeukendrup, A.E. (2010). Carbohydrate and exercise performance: the role of multiple transportable carbohydrates. Curr. Opin. Clin. Nutr. Metab. Care, 13:452-457. Jeukendrup, A. E. (2011). Nutrition for endurance sports: marathon, triathlon, and road cycling. J. Sports Sci. 29:Suppl 1, S91-99. Jeukendrup, A.E., and K.D. Tipton (2009). Legal nutritional boosting for cycling. Curr. Sports Med. Rep. 8: 186-191. Jeukendrup, A.E., and L. Moseley (2010). Multiple transportable carbohydrates enhance gastric emptying and fluid delivery Scand. J. Med. Sci. Sports 20:112-121.
eukendrup, A.E., and J. McLaughlin (2011). Carbohydrate ingestion during exercise: effects on performance, training adaptations and trainability of the gut. Nestle Nutr. Inst. Workshop Ser, 69, 1-12. Jeukendrup, A.E., M. Mensink, W.H.M. Saris, A.J.M. Wagenmakers (1997). Exogenous glucose oxidation during exercise in endurance-trained and untrained subjects. J. Appl. Physiol. 82:835-840. Jeukendrup, A.E., A. Raben, A. Gijsen, J.H. Stegen, F. Brouns, W.H.M. Saris, and A.J.M. Wagenmakers (1999). Glucose kinetics during prolonged exercise in highly trained human subjects: effect of glucose ingestion. J. Physiol. 515: 579-589. Jeukendrup, A.E., L. Moseley, G.I. Mainwaring, S. Samuels, S. Perry, and C.H. Mann (2006). Exogenous carbohydrate oxidation during ultraendurance exercise. J. Appl. Physiol. 100:1134-1141. Kellett, G.L. (2001). The facilitated component of intestinal glucose absorption. J. Physiol. 531: 585-595. Leijssen, D.P., W.H.M. Saris, A.E. Jeukendrup, and A.J.M. Wagenmakers (1995). Oxidation of exogenous [13C]galactose and [13C]glucose during exercise. J. Appl. Physiol. 79:720-725. Pirnay, F., J.M. Crielaard, N. Pallikarakis, M. Lacroix, F. Mosora, Krzentowski, G and P.J. Lefebvre (1982). Fate of exogenous glucose during exercise of different intensities in humans. J. Appl. Physiol. 53:1620-1624. Rodriguez, N.R., N.M. Di Marco, and S. Langley (2009). American College of Sports Medicine position stand. Nutrition and athletic performance. Med. Sci. Sports Exerc. 41: 709-731. Rowlands, D.S., G.A.Wallis, C. Shaw, R.L. Jentjens, and A.E. Jeukendrup (2005). Glucose polymer molecular weight does not affect exogenous carbohydrate oxidation. Med. Sci. Sports Exerc. 37: 1510-1516. Rowlands, D.S., M.S. Thorburn, R.M. Thorp, S. Broadbent, and X. Shi (2008). Effect of graded fructose coingestion with maltodextrin on exogenous 14C-fructose and 13C-glucose oxidation efficiency and high-intensity cycling performance. J. Appl. Physiol. 104:1709-1719. Rowlands, D.S., M. Swift, M. Ros, J.G. Green (2012). Composite versus single transportable carbohydrate solution enhances race and laboratory cycling performance. Appl. Physiol. Nutr. Metab. 37: 425-436. Triplett, D., J.A. Doyle, J.C. Rupp, D. Benardot (2010). An isocaloric glucose- fructose beverage’s effect on simulated 100-km cycling performance compared with a glucose-only beverage. Int. J. Sport Nutr. Exerc. Metab. 20:122-131.
van Loon, L.J., A.E. Jeukendrup, W.H.M. Saris, and A.L. M. Wagenmakers (1999). Effect of training status on fuel selection during submaximal exercise with glucose ingestion. J. Appl. Physiol. 87:1413-1420. This entry was posted in Reviews, Training and tagged coarbohydrates, Cycling Endurance exercise engineering Fatigue Profiling Heart Rate Monthly Testing Protocol Orthostatic Heart Rates Power sports and exercise engineering sports engineering Sports Exercise Engineerin. Bookmark the permalink.